Magnolia Tree Lane House is a stylish new laneway house in Vancouver, built in the backyard of an existing house. It is named for the beautiful mature magnolia tree that was the centerpiece of the yard. However the tree was located right where a laneway house would normally go, posing a design challenge for architect Bryn Davidson of Lanefab Design/Build. Given the required setbacks as well as restrictions on the overall width and height of the house, there just wasn’t room for both the tree and a laneway house. Since the owner wasn’t willing to sacrifice the tree, Lanefab had to go through the process of applying to the city for a variance from the regulations. Their approved design removed the required enclosed parking space from the laneway house itself and put it in a detached garage. 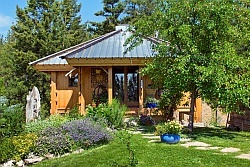 The small house has an L-shaped floor plan, with the entry sticking out from the main body of the house. Together with the garage, it forms a small courtyard around the magnolia tree, giving the home’s occupant a small private outdoor space. 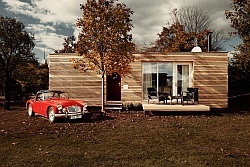 The small house has 670 ft2 (62.2 m2) over two floors. It is a split-entry design, with the front door opening to a stair landing halfway between the floors. Because the lower level is sunk into the ground, Lanefab opted for a reverse floor plan, putting the main living spaces upstairs and the private spaces down. The laneway house is oriented toward the courtyard, featuring a nice big picture window that gives a view of the magnolia tree as well as glimpses of downtown Vancouver. The window actually spans the two floors, with the top two-thirds for the living space and the bottom third bringing light into the bedroom. The house and garage were both clad in wood with a black and white color scheme. 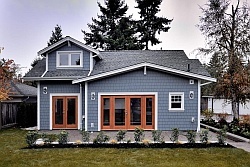 The house has whitewashed pine siding with charred cedar soffits, while the garage is the reverse. 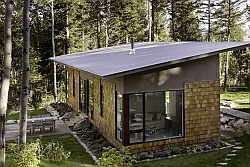 Lanefab builds all their houses with a highly insulated building envelope. This one got their standard “hybrid wall” consisting of structural insulated panels paired with an inner wall of standard 2×4 framing. The inner wall makes it easier to run electrical and plumbing, as well as giving space for a few more inches of insulation. Photographs by Marina Dodis, courtesy of Lanefab Design/Build. 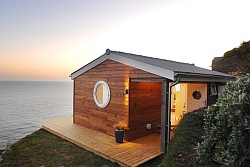 Another wonderful small house! It seems I love almost all of them. I hope, someday, I will be able to actually choose one to build. Very nice work. 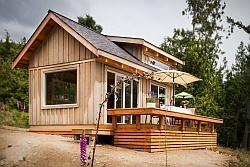 Lanefab continues to create excellent lane houses in Vancouver. Ray Wolfe Architect. Which Vancouver please! I live in Vancouver, Washington . . . the first Vancouver, thank you. This house will be opened for a tour on Oct. 24, 2015 courtesy of the owner and the Vancouver Heritage Foundation.